100% whole wheat bread studded with cranberries and walnuts in every bite. It's vegan, too! Warm the water, milk, and sugar to lukewarm (110-115°F). Add the yeast and let it sit until it's nice and foamy, about 5-10 minutes. While that's happening you can chop your walnuts and get the rest of the ingredients ready. Add the yeast mixture, oil, and molasses to the bowl of a stand mixer. Add in the flour, gluten, salt, and orange peel. Mix for 2-3 minutes then add the cranberries and nuts. Keep kneading for about 5 more minutes. Once the dough has come together take it out of the bowl and knead with your hands until the dough is nice and elastic. Form it into a ball then place in an oiled bowl. Place the bowl, covered with a dish towel or plastic wrap, into a warm place to rise until the dough has doubled, between 1-2 hours. Take dough out of bowl and knead a few times. Form it into a round loaf and place in a greased Dutch oven. Cover, and let rise for about 40 minutes until it's doubled in size. Bake in a 375°F oven with the lid on for 20-30 minutes. Take the lid off and bake for 5-10 more minutes or until it's golden brown. Set bread on wire rack to cool. Slice and enjoy! Recipe created by The Yooper Girl. You can also shape the dough into a loaf. Bake in a 9x5-inch pan uncovered for 25-30 minutes. 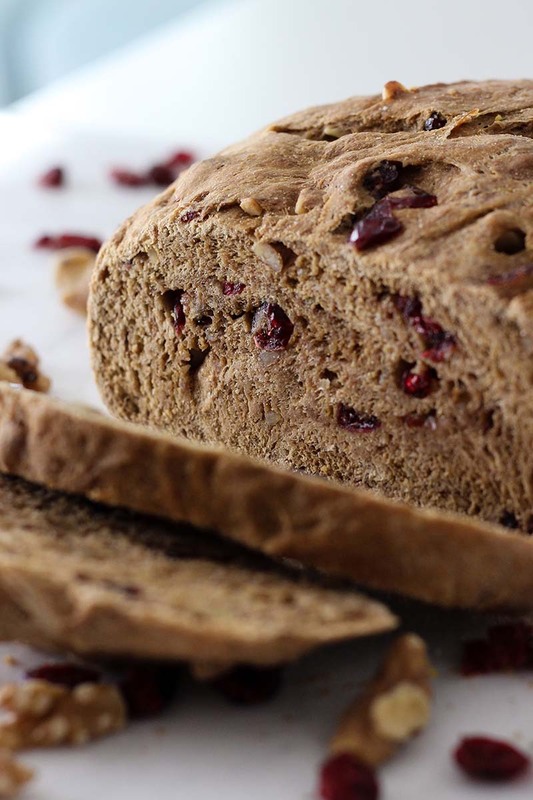 Can the “Whole Wheat Cranberry Walnut Bread” be made in a bread machine? Yes, if you have a bread machine that can hold 3 cups of flour (1 1/2-lb or 2-lb machine). Use the manufacturer’s recommendation for order of ingredients. Here’s a link for bread machine tips: https://redstaryeast.com/tips-troubleshooting/bread-machine-tips/.